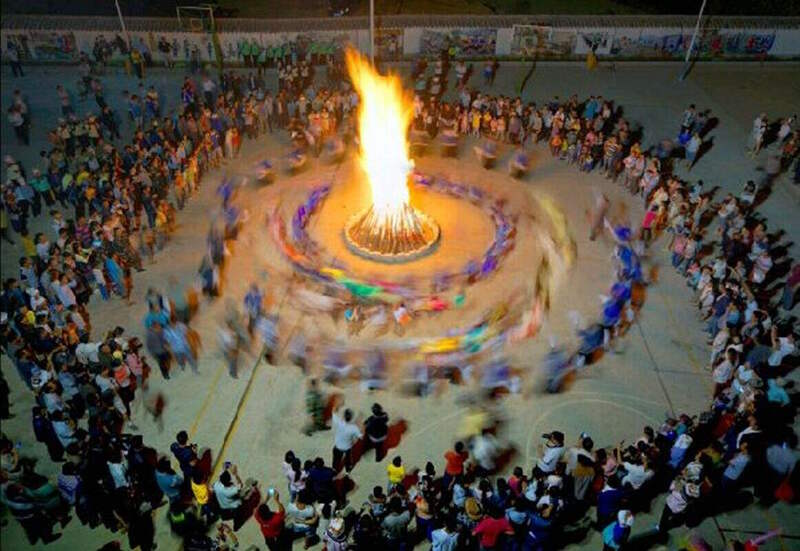 The Zhuang people celebrate many of the traditional Chinese festivals, such as Spring Festival and the Dragon Boat Festival, but they do have a few of their own! 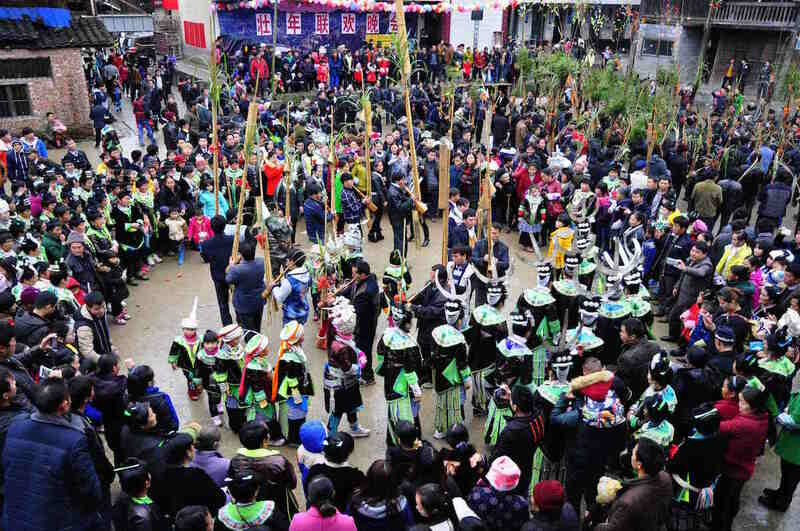 The Singing Festival, the Ox Soul Festival, and the Ghost Festival are considered the most significant, although other smaller festivals, such as the Frog Festival, have their own quaint charm. The Singing Festival, also known as “Sam Nyied Sam” in Zhuang and “San Yue San” in Chinese, takes place on the 3rd day of the 3rd month according to the Chinese lunar calendar and falls sometime during April. Before the festival takes place, offerings will be made to the ancestors and the clan cemetery is cleaned. It is then that the Zhuang youths embark on a 3 day-long trial of almost continuous singing! As the name suggests, this festival is all about singing and people from nearby villages will gather, sometimes in their thousands, simply to serenade one another. Some songs are predetermined, but many of them will be improvised and are designed to make people laugh. Choirs will even challenge each other to singing matches, where participants try to think of innovative lyrics that their competitors can’t match. Zhuang girls will also compete in a game known as the Bamboo Pole Dance. The festival is sometimes referred to as the Zhuang Valentine’s Day because it’s one of the few times in the year when unmarried youths can mingle freely. Thus it is often seen as the perfect opportunity for men and women to meet their future partner. Five-coloured rice is a festival speciality and is prepared by first dyeing rice using locally sourced plants to turn it black, red, yellow, purple and white, and then steaming it until it is fragrant and perfectly cooked. Don’t let the vibrant colours put you off; this rice is a real treat! The festival commemorates a legendary girl called Sanjie Liu, who lived sometime during the Tang Dynasty (618-907). She was an extraordinarily competent singer and no one could match her in singing competitions. Although in the original legend she might be a Han girl who was only renowned for her singing, the legend was changed in 1949 to suit political purposes and was popularised by the 1960 film Liu Sanjie. In the new version of the legend, she is described as a courageous Zhuang girl who confronted the local landlords and exposed their baseness in her songs. Her rebellious attitude eventually led to her being kidnapped and drowned in a pond by the landlords. However, she emerged from the pond riding on the back of a carp and ascended to heaven, where she became the Goddess of Singing. Regardless of the political propaganda that surrounds this legend, the date of the festival is largely believed to coincide with that of Sanjie Liu’s death. The show Impression Sanjie Liu in Yangshuo is loosely based on her legend. 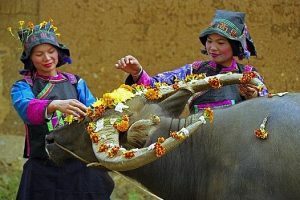 The Ox Soul Festival takes place on the 8th day of the 4th month according to the Chinese lunar calendar, falling sometime during May, and is dedicated to worshipping the Ox King. It is believed to coincide with the Ox King’s birthday and, on this day, he supposedly descends from heaven to protect his subjects from illness. Not only are oxen indispensible to the Zhuang as draft animals, but they strongly believe that the ox was sent from heaven to help them, so many Zhuang communities regard them as holy animals. On the day of the festival, all manner of sacrifices will be made to the Ox King, from glutinous rice to whole chickens. No one is allowed to work their ox that day and farmers must go to the cattle barns to free the animals from their yoke. The oxen are then bathed, which is accompanied by the beating of drums. Finally, oxen are fed with five-coloured rice while the owners sing folk songs. 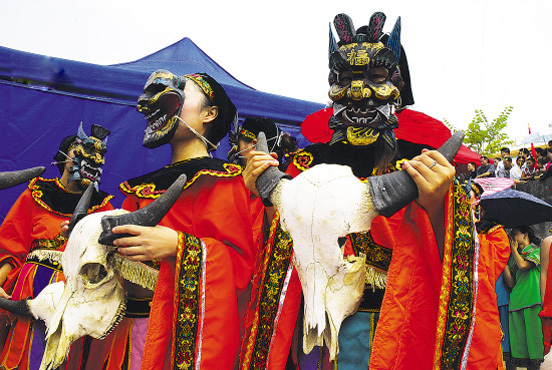 The Zhuang believe that all of the whipping and hard work during the ploughing season causes the oxen to lose their souls, so this festival is designed to summon their souls back. It reflects the love and respect that the Zhuang have for their work animals. After all, everyone needs a little TLC now and then! The Ghost Festival is celebrated over a period of several days and starts on the 14th day of the 7th month according to the Chinese lunar calendar, or sometime during August. At the start of the festival, families will stop work and clean their homes rigorously. They then prepare an offering of duck, pork, and good wine, along with some candies and fruits, and welcome the ghosts of their ancestors into the house. When the festival ends, the family will say goodbye to the ghosts and burn objects that they think the ghosts will need in the afterlife. 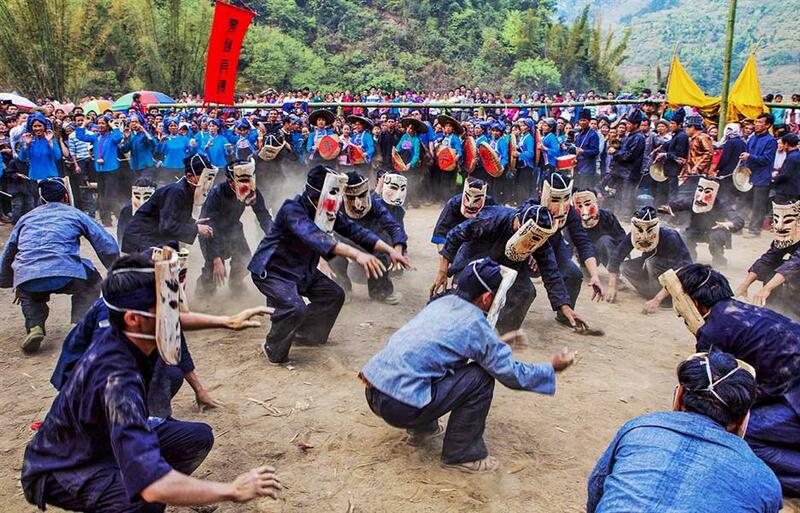 The Zhuang people worship their ancestors like gods and so this sombre festival is designed to honour them. The Frog Festival is held throughout the 1st month according to the Chinese lunar calendar, and commemorates an ancient deity known as Mother Frog. This deity is the daughter of the Thunder God and is the carrier of rains, so during this festival people pray for rain and a good harvest in the coming year. The highlight of this festival is a special Frog Dance, where performers don frog-headed hats and dance like the frogs found in the famous Rock Paintings of Mount Hua.